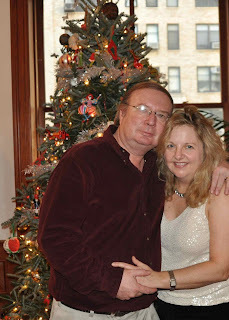 Lighthearted Locavore: Merry Christmas to all -- it was a good night! Merry Christmas to all -- it was a good night! Camille and I made a festive Christmas dinner for 8 and included quite a few local ingredients. Everyone loved it - Sandra, Wendy, Jim, Casey, Henry, Cory, Camille and moi! 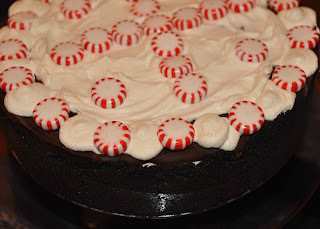 Dessert was the All-American Peppermint Stick Torte with Fudge Topping -- my family's favorite Christmas recipe that I found in Bon Appetit Magazine in 1996 (every Christmas I promise to make it again the following year). Check out the recipe here: EPICURIOUS.com for this unbelievable ice cream cake that's pretty easy to make. I increased the recipe by 50% to fit my over sized spring pan and whipped up a few more pints of Ronnybrook heavy cream, local eggs and organic, dark chocolate and Newman's Own Chocolate Cookies. YUMMY. On Friday, I'll be on a fruit and treadmill program!! Thick, heavy cream that pours out of the cute little bottles like a slow ketchup. Deliciously creamy. 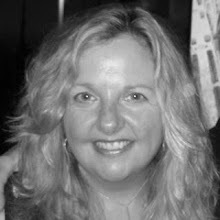 For markets and retail locations in New York and the Hamptons check out their website. I buy Ronnybrook at Citartella and Fresh Direct. Red Jacket Orchards is a family-owned farm in Western New York's finger lake region. RJO has excellent distribution in New York City's stores and farmers markets. They are located on Routes 5&20 in Geneva, where I lived when I went to college at Hobart and William Smith. 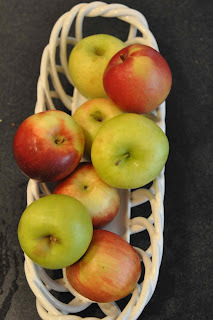 I buy the cider, juices, fresh apples, apple butter and apricot jam. Check out their website.